CHICAGO (AP) -After the Carolina Hurricanes broke out with a three-goal first period, Cam Ward took care of the rest. Eric Staal had a goal and two assists, and Ward made 25 saves for his fourth shutout of the season to lead the surging Hurricanes to a 3-0 win Wednesday night. Erik Cole and Matt Cullen also scored for Carolina, which won its fifth straight and eighth in nine games to strengthen its hold on first place in the Southeast Division. "It was a solid effort by everyone," Staal said. "We wanted to have a good start because we knew they played last night (in Detroit). "We got power plays, capitalized, and from there just went forward. It was a big road win for us." The Hurricanes scored all three goals - two on power plays - during a 3:48 span midway through the first period. Ward, who made his 10th straight start, posted his sixth NHL shutout. Ward made a handful of tough saves in his 59th game this season. Chicago's Craig Adams and Jason Williams each fired pucks off posts. "It was awesome. We took advantage of it by coming out strong," Ward said. "In the second period, it seemed like Chicago was coming on stronger, but our penalty killing was excellent. We were lucky enough that they hit a couple of posts." Keeping the Blackhawks off the board mattered to the Hurricanes. "The guys worked so hard, you want to do the best you can," Ward said. "We take pride in not letting any goals in. I'm feeling really good and fortunate to play on a team that allows me to play as much as I am." The Blackhawks lost their fourth straight (0-3-1), all but dashing their postseason hopes. 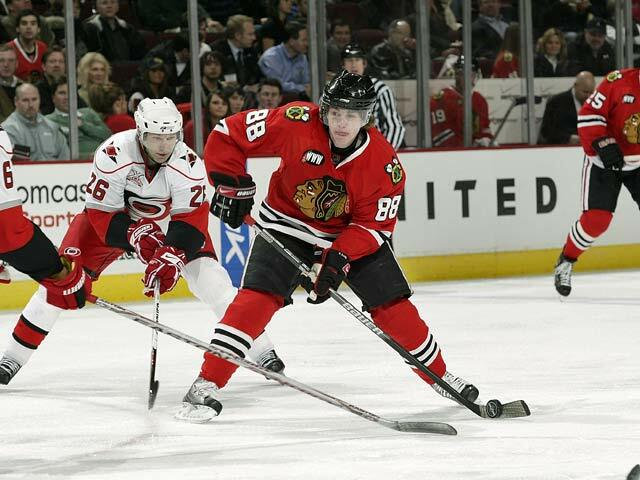 Chicago has missed the playoffs in eight of nine seasons. Rookie goalie Corey Crawford started for the second straight night and made 29 saves. Crawford started back-to-back NHL games for the first time. Nikolai Khabibulin, the Blackhawks' No. 1 goalie and highest-paid player, missed his 11th straight game due to back spasms. "I don't think it was going our way tonight, to get the puck in their net," Crawford said. Chicago coach Denis Savard and right wing Patrick Kane, the NHL's rookie scoring leader, were more critical of their team's performance. "We gave them three goals really," Savard said. "We can't give opportunities to a player like Staal because he'll capitalize." Cole's power-play goal opened the scoring 8:57 in. Left wide open in the slot, he took Sergei Samsonov's centering pass and beat Crawford with a shot that trickled between the pads. Cullen's power-play score 1:42 later made it 2-0. After Staal's drive from the point hit traffic in front of the net, Cullen converted the rebound. Staal extended the lead to three goals with 7:15 left in the first. He slipped past Chicago's defense, then broke in alone on Crawford. "The last two games, I don't think the effort's really been there and the results, obviously, haven't been there either," Kane said. Ward made one of his few tough saves midway through the scoreless second, stopping Dave Bolland's one-timed shot from the right circle. Chicago's Adams broke in and clanked a shot off the right post with 6:08 left in the second. With 2:29 remaining in the period, Ward made a point-blank save against Kane. A shot by Chicago's Williams hit the left post 7:40 into the third . Notes: Carolina D Glen Wesley returned after missing a game with a foot injury. ... Six Hurricanes sat out with injuries: LW Wade Brookbank, LW Ray Whitney, C Rod Brind'Amour, C Chad LaRose, RW Justin Williams and D David Tanabe. ... Including Khabibulin, five injured Chicago regulars missed the game: LW Martin Havlat, D Brent Sopel, C Yanic Perreault and LW Ben Eager. 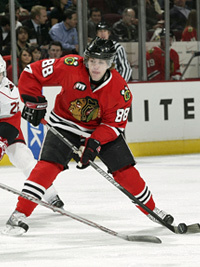 ... Chicago D James Wisnieswki served a one-game NHL suspension for cross-checking Detroit's Mikael Samuelsson on Tuesday. ... Pro Football Hall-of-Famer Gale Sayers dropped the ceremonial first puck.